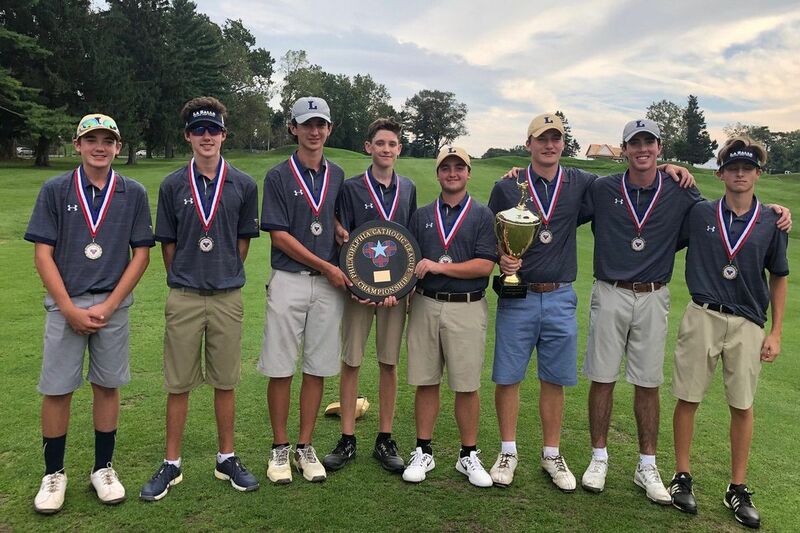 The La Salle golf team captured its second consecutive District 12 Class 3A championship on Tuesday. The La Salle golf team captured its second consecutive District 12 Class 3A championship on Tuesday. Fresh off their fourth consecutive Philadelphia Catholic League championship, the Explorers ended with an overall score of 302. St. Joseph's Prep (321), Bonner-Prendergast (332), and Cardinal O'Hara (343) rounded out the top four. La Salle advances to Thursday's subregional match against Emmaus of District 11 at the Steel Club. Steve Lorenzo of La Salle shot a 3-over par 73 at JC Melrose Country Club to win the individual title. Frank Gregor (La Salle), Griffin Caulfield (La Salle), and Nick Scarpone (St. Joseph's Prep) tied for second with a 75. All four golfers qualified for the East Individual Region Championship held Monday, Oct. 15 at Golden Oaks Golf Club. Central Bucks East's Patrick Sheehan claimed the District 1 Class 3A individual golf title in a playoff at Turtle Creek Golf Club. Sheehan, Central Bucks West's Luca Jezzeny, and Holy Ghost Prep's Liam Hart finished the first two rounds tied for first at 5-under par. Unionville repeated as champions in the team competition with an overall score of 291, which was four strokes better than Holy Ghost Prep. Great day for UGolf! Boys repeat as the D1 Team Champs with 4 going on to Regionals! AJ Aivazaglou shot a 1-under 35 as Haverford School won the Inter-Ac Invitational at Bluestone Country Club. The Fords ended with an overall score of 182, which was seven strokes better than Episcopal Academy. West Chester East's Victoria Kim ended even-par to capture the District 1 Class 3A individual golf championship. Jade Gu of Pennsbury and Unionville's Charlotte Scully tied for second at 3-over par. Mount St. Joseph (236) finished one stroke better than Downingtown East to win the team event. Unionville continued its dominant season with a 5-0 victory over West Chester Rustin in the first round of the District 1 Class 3A playoffs. At first doubles, Bailey Santaguida and Faith Ilgner prevailed with a 6-1, 6-1 win over Rustin's Anna Hedstrom and Abby Kane. The Indians will face Radnor, a 5-0 victor over Methacton, in the second round on Thursday. Chloe Abramowitz, Nina Dzidic, and Madison Urbano won their respective singles matches as Merion Mercy discarded Upper Moreland, 5-0, in the first round of the District 1 Class 2A tournament. Maddie Mast helped Central beat Northeast, 5-0, in the Public League Class 3A semifinals. Mast defeated Anna Kalinovskaia, 6-1, 6-4, at No. 1 singles. Central will play Girls High, a 3-2 winner over Washington, in the final. Elizabeth Deal scored in overtime to give St. Basil a 2-1 win over Gwynedd Mercy. Sophia Mahoney also scored for the Panthers. Paige Malpezzi netted three goals in Lower Moreland's 7-0 victory over MaST Charter. Nicole Castor added two goals. Casey Touey and Bella Azcona had two goals apiece as Abington blanked Plymouth Whitemarsh, 9-0. Benjamin Rush received two goals from Alicia Brickhouse in a 3-0 triumph over Engineering & Science. Emaleigh Calhoun and Reagan Shissler combined for the shutout in goal. Harrison Malone and Jack Pacera found the back of the net in Episcopal Academy's 2-1 win over Penn Charter. The Churchmen improved to 11-0-1 overall and 3-0 in Inter-Ac League play. Ethan Pace's penalty kick with 30 seconds remaining propelled Pottsgrove past Upper Merion, 3-2. Sandesh Tamang scored twice as Furness beat Swenson, 3-0. Hannah Miller scored in overtime as Villa Maria rallied past Mount St. Joseph, 5-4. Meghan Dillon scored in the final seconds of regulation. Sammy Popper recorded four goals as Germantown Academy held off Penn Charter, 5-1. Claudia Zanine scored in overtime to give Upper Moreland a 1-0 decision over Springfield (Montco). Isabella Guarenghi made six saves for the Golden Bears. Hannah Havrilla scored the lone goal as Wissahickon took down Abington, 1-0. Ava Borkowski notched a hat trick in Plymouth Whitemarsh's 5-0 win over Upper Dublin. The Colonials have won 51 straight Suburban One League American Conference games.